Built: Origins lie in the Middle Ages, but most of the present building and the gardens was added by Sir Charles Barry between 1835 and 1850. Ownership / Access: Sutherland family. 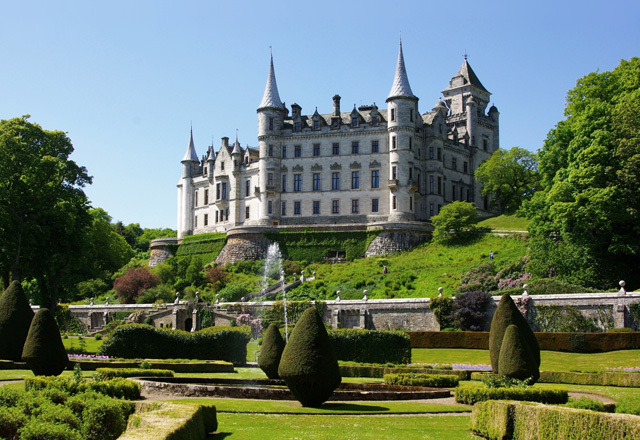 Notes: Dunrobin Castle is a stately home in Sutherland, in the Highland area of Scotland, and the family seat of the Earl of Sutherland and the Clan Sutherland. It is located 1 mile (1.6 km) north of Golspie, and approximately 5 miles (8.0 km) south of Brora, overlooking the Dornoch Firth. Dunrobin's origins lie in the Middle Ages, but most of the present building and the gardens was added by Sir Charles Barry between 1835 and 1850. Some of the original building is visible in the interior courtyard, despite a number of expansions and alterations that made it the largest house in the north of Scotland. After being used as a boarding school for seven years, it is now open to the public.